So let's move on to last month (February)'s empties now, shall we? Hooray for this month's empties because I finally finished a lip balm, yay! ;p Lip balms are not the easiest item to finished because somehow it took me so long to just finish one lip balm, so I always wonder how other bloggers seems to be able to finish their lip balms (and any other balms) quite fast. Maybe it's the fact that they live in countries with colder weather / winter so they need to reapply lip balms quite often, while me on the other side, leave in a tropical country where my lips doesn't get dry easily unless the weather is cold or if it's raining all day. That's my hypothesis, LOL. I bought this at Carrefour a looooong time ago. I was crazy about papaya products back then because I learned that papaya is the #1 ingredient to brighten skin. The word "whitening" in the bottle is very biased because you CAN'T whiten your skin tone. I think "brightening" is more appropriate. Some of you might like papaya scent but I don't, and that's why I abandoned this product. But I was eager to finish it so I started using it again. I like the texture which easily absorbed without leaving any residue. The scent would linger too. I do not notice any brightening effect though..
- Recommended? Yes, if you like strong papaya scent. - Repurchase? Although it's cheap but it's not for me. I got this as a set of VS Pure Seduction body wash + body lotion + body spray in a pink clutch. I mentioned this a couple times that I prefer the old version of Pure Seduction than this one. This one is too sickly sweet for me, but it would be great for you who loves super feminine sweet floral scent. Nothing special about the texture of the body wash, it was OK.
- Recommended? Yes, if you like super sweet scent. - Repurchase? No, I prefer other scents. I was curious with Fruttini shower gels because I never tried this brand before so when I saw them at Sasa I purchased the travel size ones to try out. I chose this one and the Pineapple Prosecco one which I had finished first back in December. I think this one is better than the Pineapple one. This one smells good and you can't smell the ginger in it, only the passionfruit scent, which is great. Other than the scent, the texture of this shower gel is about the same as any other shower gels. - Recommended? Yes, because it's cheap. - Repurchase? Maybe, I might try other scents / variants. This shampoo is infused with a fusion of mandarins and pearls to tame and smooth out unruly, frizzy, and flyaway hair. This shampoo is also meant to smooth your tresses. My hair did get very smooth using this shampoo, but sometimes it gets too smooth that my already fine hair turns into a limp lifeless hair. I love the scent of this one, it's sweet and fruity although the scent didn't linger long on my tresses. - Recommended? Yes, if you have unruly hair. - Repurchase? No, definitely not for my type of hair. This is supposedly Clarins' no.1 serum in Asia, it is meant to help achieve that V-shape contours on every angle of our face. I know that sounds impossible but I saw it on the launching event how this serum can make a chubby cheek lines seems to changed itself into a more thinner lines. It is of course not for long term, I mean only surgery can do that, but I think this is great for when you have a big event or special occasion when you want to look your best. - Repurchase? Probably not because it's too pricey for me. - Recommended? Yes, it's so cheap. - Repurchase? Yes, in different variants. It took a while for me to finally empty this big tube of face wash! There are a lot of it inside, really worth the money. I have reviewed this before and my opinion remains the same. This is great for daily face wash / daily scrubs because it's so light. The only down side I could think of is the cap which wouldn't close properly after several times of use, other than that it's pretty good. - Repurchase? No, because I want to try other brands/variants. Yay, I finished a makeup item ;) For me, make up needs much longer time to finish because I don't wear full make up daily, only on special occasions or when I go to somewhere nice or work-related. If I only want to go grocery shopping or to a friend's house then I only use light makeup. Anyway, this lipstick has been one of my go-to lipstick which I wore often. This one has a pink-ish shade which goes on quite sheer so you have to apply it a couple of times if you want more colors. But 2 swipes are enough for me if I want to use it for casual daily look. - Repurchase? Yes, in the future. This is made from natural ingredients and it's a renewing peel that works in just 8 minutes! It's great for anyone with dull skin. This product is supposed to give you the result of professional face peeling that you get at beautician, but with this renewing peel you can easily do it yourself at home. I have fully reviewed this product before and my opinions remains the same. It does makes my dull skin appears brighter and fresher. I never like traditional / medicinal oil such as Minyak Kayu Putih (cajuput oil) because of the scent. But I often have gastric problem so I always need to have a medicinal oil by my side. When this aromatherapy version of medicinal oil comes out I was ecstatic because I love aromatherapy and now I don't have to use the stinky medicinal oil anymore ;) This lavender one is my most fave among other variants. 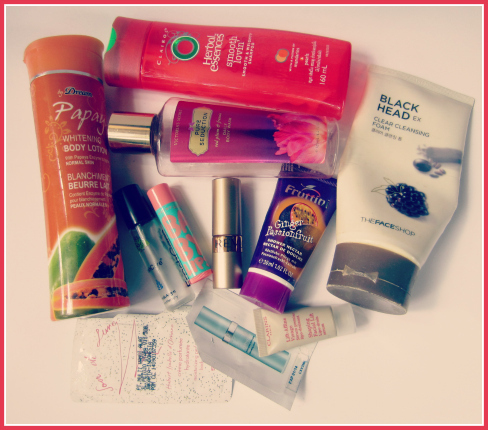 To see my January Empties, click here. Oh I tried that shampoo once but didn't like the result of it, not good for my hair XD great post dear!